What are the problems with AEGR? •Shareholder lawsuit: "False and misleading statements"
•If sales flatten out or decrease, the stock price has a very long way to fall. •AEGR claims a USA patient population of 3,000, while the very scientists on their drug say there are only 300. Nobel Prize winners also say there are only 300. If the scientists are correct, then AEGR's promotional attempt at more than 300 could constitute off-label marketing and could explain the current DOJ investigation. •European sales have yet to deliver any meaningful revenue. 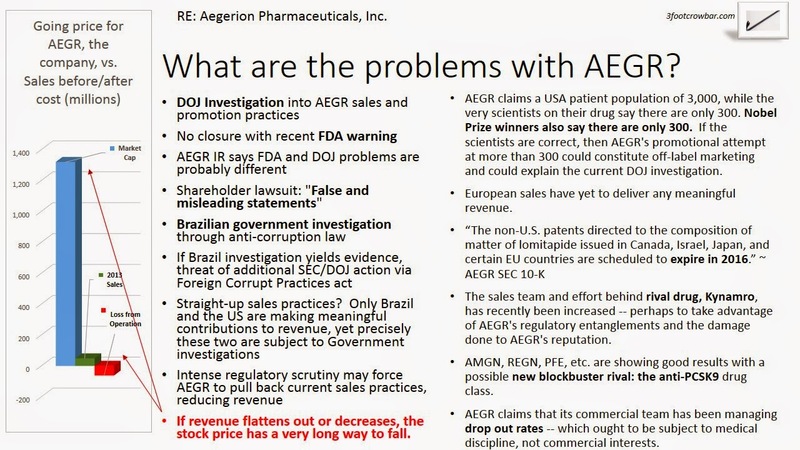 •The sales team and effort behind rival drug, Kynamro, has recently been increased -- perhaps to take advantage of AEGR's regulatory entanglements and the damage done to AEGR's reputation. •AMGN, REGN, PFE, etc. are showing good results with a possible new blockbuster rival: the anti-PCSK9 drug class. •AEGR claims that its commercial team has been managing drop out rates -- which ought to be subject to medical discipline, not commercial interests.